A satellite image shows Hurricane Florence looming in the Atlantic Ocean as the sun rises over the U.S. Florence is expected to bring tropical storm conditions to North Carolina and South Carolina on Thursday. 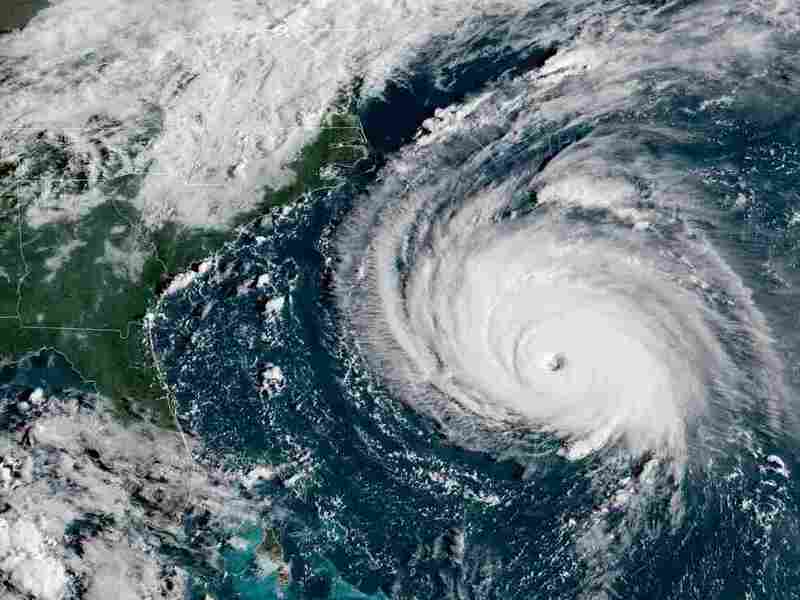 A hurricane warning – meaning hurricane conditions are expected within 36 hours — is in effect for a long stretch of the coast, from the Santee River in South Carolina to Duck, N.C. — part of the Outer Banks. Hurricane conditions will likely hit on Friday, but tropical storm conditions will arrive on Thursday, the hurricane center said. “Preparations to protect life and property should be rushed to completion,” the agency says. Hurricane Florence is now expected to head more directly west after making landfall, cross through South Carolina. The storm will bring dangerously high amounts of rain, forecasters say. 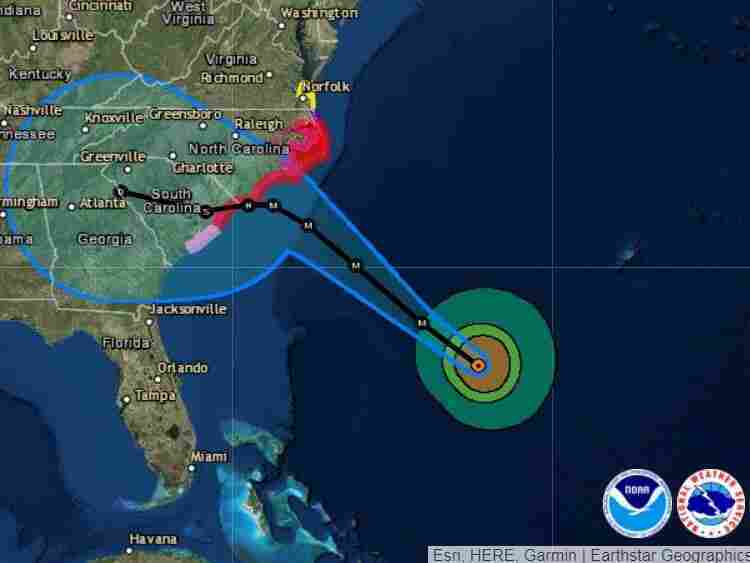 Forecasters have adjusted Hurricane Florence’s predicted path, saying that after it makes landfall, it will likely take a more southerly route than had previously been expected. Rather than pushing up toward western Virginia, the storm’s center is now predicted to move across the middle of South Carolina. For a swathe of the North Carolina shore from Cape Fear to Cape Lookout, the storm surge could range from 9-13 feet, the NHC said. In Myrtle Beach, S.C., and nearby areas, the surge could hit 6-9 feet. As of 8 a.m. ET, Florence was 530 miles southeast of Cape Fear, N.C., moving west-northwest at 17 mph, the National Hurricane Center said. “An Air Force Reserve Hurricane Hunter aircraft that was in the hurricane until just after midnight” recorded a peak wind gust of around 150 mph, the hurricane center said. Florence is currently heading for ocean water with surface temperatures of around 85 degrees, meaning it will likely strengthen on its way to the East Coast. Satellite images show the storm has maintained a distinct eye, and it’s well organized. Its maximum sustained winds are expected to top 145 mph before it loses some steam near the coast. Current forecasts call for its winds to be at least a Category 3 storm when it arrives at the Carolinas. The slow movement, combined with the massive amount of moisture this storm holds, will bring dangerous rains – from 20 to 30 inches in coastal North Carolina, with 40 inches possible in isolated areas, the weather service says. In South Carolina and inland parts of North Carolina, 5 to 10 inches of rain could fall, with 20 inches possible in some areas. “This rainfall would produce catastrophic flash flooding and significant river flooding,” the hurricane center said.